The man up defense or "Red" is one of the oldest defensive schemes. It disappeared for years with the popularity of rotational defense. Red defense is making a resurgence lately, and any team coached by an old high school coach is likely to play the Red. "Defense should be designed so that it allows for putting the best diggers in areas that will most often be attacked." With man up defense, hits are naturally kept in front of the defenders because their base is a lot deeper. Strengths: The biggest thing about this defense is that it disguises some of the personal liabilities that face many coaches at these levels. This defense also defends the middle attack better because of different starting base. Hits down the line and tips are also defended well. There isn't much movement required for the defender to get from their base to their defensive zones. Weaknesses: The player that is playing "man up" has to move really well. The man up is usually a Right Back player (it's the setter if they're back row). 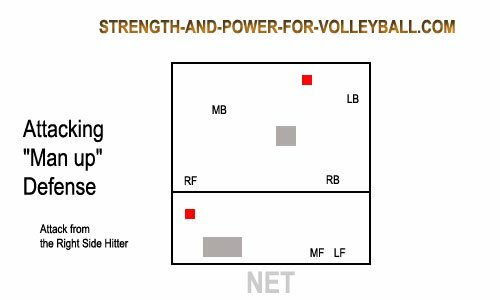 Without some disciplined and consistent blocking, the red defense is highly vulnerable because it exposes the middle-up to powerful quick attacks and outside shoot attack hits. The base defensive positions for the "man up" Red Defense are what give it some of it's strengths. It does not require much post set movement, and keeps the wing defenders deep, keeping attacks in front of them. It does not require the wing player to back up, only move forward. The man up defense requires two defenders in the back row that can cover a large area of the court. Players that are quick defenders and can pass serve receive really well, typically love playing this style of defense. Defenders who fit this description will revel in the challenges of this system and enjoy this kind of responsibility of playing defense. In the above graphic, the "man up" is the Right Back player. 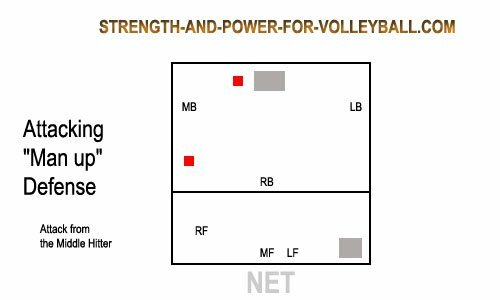 The setter is usually the most mobile player on the team, so this can be an advantage having the setter take the short balls. Also, the setter can create "instant offense" by setting the first ball to the outside or offside attacker. If you don't want your setter taking the tips, another option is to move the setter back and bring the Middle Back player up short to cover the balls sent behind the block. 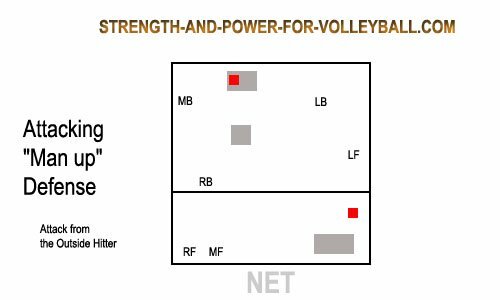 Teams that are giving many "free balls" will likely have trouble reacting quickly to this "over on two" attack (example, setter taking the first ball and setting a hitter). Also, the setter doesn't have to worry about being called for their hands since this is the first team contact. 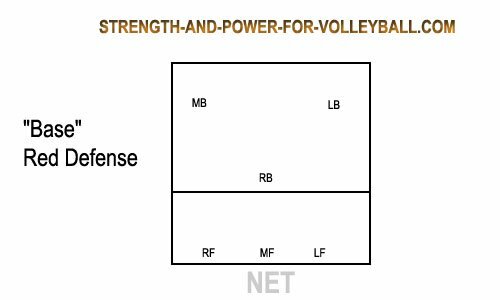 This "over on two" attack also might be a good option if your team only has one player that sets well and you're having trouble getting a good attack off of the setter passing the ball to a weaker player that's forced to set an attacker.